Boroughmuir coach Bruce Aitchison has warned his men to expect a backlash when they face Currie on BT Premiership duty at Malleny Park tomorrow (kick off 3pm). Muir, who are desperate to halt a losing run that now extends to six matches, have Ed Farquharson at full-back, Rob Cairns on the wing and Logan Bonar at stand-off, while up front Fin Field starts at lock and Will Kay is in the back row. “Malleny is a hard place to go and Ben (Cairns) will have his squad fired up to recover from last week’s game,” said Aitchison. Cammy Gray replaces Blair Kinghorn in the back line, Charlie Shiel rotates in for Richard Snedden at scrum-half while, in the pack, Mike Vernel and Hamish Bain come in for Alex Heather and Stephen Ainslie. Heriot’s are back on their home patch to face bottom side Selkirk (kick off 2pm). The Borderers have improved significantly over recent weeks and there will be no complacency in the home ranks. 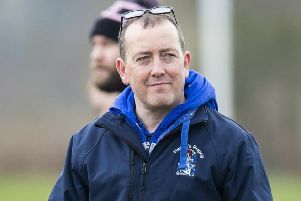 “Selkirk scored four tries against us at Philiphaugh so the last thing we will be doing is underestimating them,” insisted coach Phil Smith, who makes three changes with Martin Bouab, Ian Wilson and Tom Wilson all starting. BT National Division One leaders Watsonians are on the road to face second-placed Howe of Fife and the Myreside men could move closer to landing the single guaranteed promotion slot if they can post a win. Edinburgh Accies travel to face basement side Peebles, Musselburgh can move closer to securing survival with a win at GHA and third-bottom Stewart’s Melville face a vital clash at Kelso, the side immediately below them. Preston Lodge will be out to maintain their good form in Division Two when they head west to meet Hillhead/Jordanhill. Lasswade are also away from home, with Whitecraigs their opponents. In Division Three, Haddington face West of Scotland in a third versus fourth tussle, Livingston host East Kilbride and RHC Cougars have a tough assignment at GHK.